Nurses are at the forefront of healthcare delivery in America's increasingly complex healthcare system, and the demand for qualified nurses is on the rise. A 2010 report by the Health Resources and Services Administration found that a large proportion of nurses are working in the late stages of their careers. As these professionals begin entering retirement, new nurses will be needed to fill their roles in the coming years. Job prospects are strong for students currently pursuing a degree in nursing; the Bureau of Labor Statistics (BLS) projects that the employment of registered nurses (RNs) will grow around 16% between 2014 and 2024. The most common way to earn RN credentials is to pursue an associate degree in nursing (ADN) at a community college. However, obtaining a bachelor of science in nursing (BSN) is invaluable for upward mobility and increased earnings in the profession. BSN degree-holders typically work in hospitals, areas of research, and community healthcare centers. An increasing number of nursing students are now choosing to pursue their BSN degrees online. Not only is an online degree more affordable, but the distance format allows nursing students to complete their schooling and advance their careers while they work. With hundreds of cheap online RN to BSN programs available, finding the right one may seem like an overwhelming task. At BestColleges.com, we use our unique College Affordability Score to make the process easier. By weighing factors such as return on investment (ROI), the amount of financial aid given to students, and loan default rates among students, we've created a list that ranks schools based on their overall value, rather than just a cheap tuition up-front. Each school included in the ranking offers students a quality, affordable online RN to BSN degree program that is guaranteed to pay off in the long run. Operated in association with The Church of Jesus Christ of Latter-day Saints, BYU-Idaho offers an affordable RN to BSN online program with start dates available every semester. Students can typically complete their degree within 3-6 semesters, with courses available online and on-campus. Students have up to eight years to complete the program. BYU-Idaho uses a cohort-based learning model, which has students move through semesters together in the same course sequence, providing opportunities for collaboration. Admission to the program requires an existing degree or diploma in nursing, which equates to 46 credits. Students then take an additional 27 credits in advanced nursing courses, covering topics such as leadership, community nursing, pathophysiology, and health/wellness in aging adults. Students who transfer into the program through BYU-Idaho’s Pathway online program are eligible to receive a tuition discount. Graduates are prepared for careers in many settings. Based in Waterloo, Iowa, Allen is a private nursing college that offers one of the most affordable RN to BSN online programs in the region. The school requires a total of 124 credits for graduation, and students must earn their general education requirements from another accredited institution. The degree typically takes around five semesters of part-time coursework to complete, with courses including topics in nursing informatics, collaboration and communication in healthcare, health policy, and chronic illness. Students can also take an accelerated hybrid program that can be completed in about 15 months, though it requires several campus meetings. Both program formats include a clinical practicum placement that allows students to gain hands-on experience through supervised work in a professional healthcare facility. The facility can be a current place of employment or another location arranged through the college. Due to differing state regulations, Allen can’t guarantee clinical placements for students residing outside of Iowa, and out-of-state students should consult the school’s admissions office before applying to the program. Sentara is a major healthcare provider in the Virginia area, and its College of Health Sciences, based in Chesapeake, offers one of the most affordable RN to BSN online programs in the state. Designed for working students, the program offers start dates in January and August and allows for part-time or full-time study. Learners must have a minimum of 25 general education credits; additional credits may be needed to enter the nursing program. Students who possess an associate of arts, associate of arts and sciences, associate of science, or any bachelor’s degree can typically apply general education credits towards the program and enroll immediately. Sentara charges the same tuition rate to in-state and out-of-state students, but state requirements for nursing licensure vary, and students residing outside of Virginia should contact the school to determine if the program meets local requirements. Thomas Edison State University offers a range of respected online programs, including an RN to BSN online. The program is flexible, offering open and rolling admissions that allow students to enroll anytime throughout the year. Courses are offered asynchronously. TESU requires that students take at least three credits each year to maintain enrollment. The degree requires 120 credits for graduation, with 48 credits dedicated to professional nursing courses, including topics in nursing research, health policy, advanced health assessment, and validating nursing competence. Students also take 24 credits of electives, allowing them to augment their degree with knowledge from related fields. For students interested in pursuing further education, the nursing core includes nine graduate credits that can be applied toward the school’s master of science in nursing. The school offers credit for prior learning experiences. UTHealth, part of the University of Texas System, is based in Houston’s Texas Medical Center, which ranks as the largest grouping of medical facilities in the world. The school offers flexible, affordable online RN to BSN programs that can be completed in two to nine semesters. Most students choose a three-semester option, which includes 10 credits for the first two semesters and 11 credits for the final semester. During their final semester, students complete a two-credit, 90-hour community health project, which allows them to gain clinical experience in a professional healthcare environment. UTH offers courses in a fully online or web-enhanced format, which is structured around predominantly online courses. The web-enhanced format includes some campus meetings for presentations, exams, and other special events. For students able to make occasional visits to the Houston campus, the web-enhanced format offers greater opportunities to interact with peers and faculty. UTMB, founded in 1891, is the oldest medical school in Texas, and its School of Nursing was also the first in the state. The college is based in Galveston, but UTMB’s online RN to BSN programs serve students across the state. Intended for licensed nurses who already possess an associate degree, the program is streamlined and emphasizes leadership skills and the development of professional nursing practices. With full-time courses, the degree can be completed in eight months; a part-time option is also available. The curriculum requires 30 hours of core nursing courses, including major topics in evidence based practice, clinical reasoning, communication and population based care, and legal and ethical issues. Except for a two-day campus orientation at the beginning of the program, all courses can be completed entirely online. TTUHSC, located in Lubbock, Texas, is a major provider of health education in the state, serving more than 4,400 students annually. The school offers one of the best RN to BSN online programs, which has three start dates throughout the year. The degree emphasizes flexibility and convenience, and all course are available entirely online. Applicants must possess either an associate degree or diploma in nursing from an accredited college, along with current Texas RN licensure. While there is not a set GPA requirement, applicants are evaluated on their GPA for the last 60 credit hours, with no “D” or “F” grades accepted. TTUHSC’s nursing program includes 33 credits of upper division nursing major courses, highlighting topics in caregiving, health assistantship, family nursing, community health, and nurse as research consumer. Online nursing students at TTUHSC receive one-on-one mentoring from an assigned faculty member who can help them with course selections, professional opportunities, and other academic decisions. Online academic advisers are also available. CCHS, founded in 1942 to meet an increasing need for registered nurses, is a center of healthcare education in Concord, North Carolina, that offers a range of medical and health services degrees, including an affordable RN to BSN online. Full-time students can complete the program in about two years, while part-time completion depends on how many courses students take each semester. Students enter the program with up to 61 credits awarded for their nursing associate or diploma. CCHS requires students to earn an additional 61 credits for graduation, including 40 credits in upper level nursing courses and 21 in general education credits. The nursing curriculum includes unique courses such as nursing in society, coping with grief and loss, and transitions in care. During the final semester, students complete a clinical service learning project that has them create a health education project for an identified population group in their own community. A&M, located in College Station, is the largest college in Texas, serving a student body of over 60,000 through campus courses and online programs. The school offers one of the best online RN to BSN programs in the state. The program has two start dates, one in the spring and summer, with a flexible, fully-online course schedule that accommodates working students. Students also have three curriculum options, taking either one year, one and a half years, or two years to complete the program. Applicants must hold an associate degree in nursing and a current, unencumbered Texas RN license, or become licensed during the first semester of the program. Licensed vocational nurses or paramedics who complete an RN pathway must transfer at least 35 credits into the BSN program, and these students should contact A&M academic advising to ensure they possess the correct prerequisites. UNMC, located in Omaha, Nebraska, is one of the top healthcare education centers in the Midwest. Focused on the latest developments in nursing practice, the RN to BSN online incorporates curriculum recommendations from progressive healthcare organizations, including the American Association of Colleges of Nursing, the Carnegie Foundation, and The Institute of Medicine. While all coursework is available fully online, some classes feature synchronous meetings that require students to log on at designated times. UNMC requires six nursing courses for degree completion, totaling 20 credits. Students have the option to take 1-3 courses each semester, allowing them to complete their degree in 1-3 years, depending on course load. Students must also complete a supervised clinical placement at a local healthcare organization, which can be arranged through one of UNMC’s more than 100 partner institutions or a student's' current employer. USF, located in Tampa, Florida, offers an affordable RN to BSN online that features three concentrations: leadership/management, patient/staff education, and clinical excellence. The curriculum includes 15 credits of core nursing courses, six credits in concentration courses, and nine credits in nursing electives. The program also includes a service learning practicum that students complete at their place of employment. The practicum is not a clinical experience, but does involve opportunities for an organizational cultural assessment, a patient education project, a project in evidence-based practice, and a patient population assessment. Students have the option to complete the program in either five semesters of part-time study or three semesters of full-time study (requiring approval from the program director). For learners interested in advanced study, completion of the RN to BSN program allows for seamless transfer into USF’s master’s in nursing. Founded in 1889, UMB’s School of Nursing is one of the oldest in the country, and the school also offers a robust online program. The RN to BSN online includes an optional concentration in care coordination with a health IT focus, which explores the role that new technology plays in improving patient care. The health IT concentration is part of the general curriculum, encompassing three elective courses: health informatics for registered nurses; care coordination: theoretical foundations and applications; and care coordination, outcome measurement, and practice improvement. The concentration teaches specialized knowledge in technology-based care coordination, which is indicated on their transcripts. Regardless of concentration, students also complete 90 hours of clinical practice, allowing them to gain advanced professional experience through supervised work in a healthcare facility. The degree requires 31 credits in nursing courses, which can be completed in two semesters of full-time study. With more than 64,000 students, UCF is the largest college in the country by enrollment and a major provider of online education. The school offers one of the most affordable online RN to BSN programs in Florida. It's available in a fully-online format or in a hybrid model. Applicants must possess a valid RN license and an associate degree from a Florida college, or complete UCF’s general education requirements, which includes 12 courses and a foreign language component. Requiring 30 hours of nursing coursework, the degree can be completed in three to ten semesters, depending on desired course load. Students can earn up to 27 credits for prior learning experiences in the areas of childbearing and rearing, adult health, and psychiatric mental health. However, these credits aren’t awarded until the final semester. Excelsior, founded in 1971 as an external degree-granting program for distance students, has a history of nontraditional education. The National League for Nursing has designated Excelsior’s School of Nursing as a Center of Excellence in Nursing Education through 2021, indicating the highest quality for the school’s healthcare programs. Designed for registered nurses to earn their bachelor’s without the need to interrupt current employment, Excelsior’s RN to BSN online programs offer maximum flexibility for working students. The curriculum includes 60 credits in nursing, 30 of which are awarded for prior learning and work experience. The remaining 30 credits include topics in nursing research, holistic healthcare across the lifespan, community health nursing, and leadership and management. The program concludes with a four-credit capstone course, which synthesizes overall program learning objectives. Saint Francis, located in Peoria, Illinois, is a teaching hospital and the largest healthcare facility in central Illinois. The College of Nursing offers one of the best RN to BSN programs online, providing an accelerated pathway for working nurses to earn their bachelor’s degree. The program includes 31 credits of nursing core classes, such as healthcare ethics, healthcare assessment, promoting healthy communities, and concepts in nursing management. The curriculum also requires an eight-credit experiences in clinical nursing course, which simulates professional healthcare activities. Saint Francis respects the experience of veteran nurses, and students who possess five years or more of professional nursing experience may receive credit for prior learning based on individual assessments. State regulations permit residents of the following states from attending: Iowa, Louisiana, Maryland, Massachusetts, New Mexico, New York, and North Carolina. Residents of other states should contact Saint Francis to determine if the nursing program meets local requirements. University of North Florida, located in Jacksonville, offers one of the state’s top online RN to BSN programs, a completion degree that can be finished in 12 months. The 30-credit program includes core courses in nursing science, family/community assessment, applied nursing ethics, and perspectives in chronicity. The nursing program is offered entirely online. The school emphasizes community and public health nursing, with several opportunities for students to interact in the field outside of the online learning environment. Students complete a community experience at a public health agency (e.g., hospitals, homeless shelters, home care agencies, or clinics), working to promote health within community populations. Students also gain industry experience and networking opportunities through nursing conferences, professional meetups, and civic meetings. UNF encourages students to find their own community opportunities that fit around their work and family obligations. Governors State, serving around 5,600 students annually, is a comprehensive public college that operates out of University Park, Illinois. As one of the best RN to BSN online programs in the state, the degree offers start dates in the fall and spring and admissions options for students with all prerequisites complete and for those with prerequisites outstanding. Full-time students with all prerequisites complete can finish the program in three semesters; part-time students, and those without prerequisites, will take longer. The curriculum requires 27 credits of nursing courses and eight credits of upper division courses, which typically take the form of electives. The program core covers topics such as pathophysiology, health assessment, public health promotion, and leadership for patient safety. Students also complete a three-credit public health practicum course that allows them to apply course learning to hands-on work at a healthcare facility. WGU has operated as an online college since it was founded in 1997. Students receive a flexible, affordable education. Designed to serve the needs of working students, WGU operates on a competency-based curriculum model, which allows students to test out of courses by demonstrating proficiency in key subject areas. This means experienced nurses in the school’s online RN to BSN programs can skip course topics they already know, saving both time and money. WGU charges the same tuition rate each term regardless of course load, so students capable of taking on a heavier schedule can save on tuition. The curriculum covers topics in nursing science, theory, and practice, with courses such as leadership and professional image, community health and population-focused nursing, and nutritional science. All students complete a 90-hour nursing field experience, which includes community assessments, simulations, and supervised fieldwork at healthcare organizations. Lincoln Memorial, a private liberal arts college in Harrogate, Tennessee, operates extended learning sites throughout the state and in Kentucky and Florida. The school’s RN to BSN online prepares graduates to serve as generalist nurses, offering opportunities for career mobility and advanced education. The program requires 29 hours of nursing credits, with courses including pharmacology to promote adaptation, health assessment of humans, promotion of adaptation in the elderly, and foundations of nursing informatics. Current registered nurses can receive up to 31 upper-level credits for demonstrated proficiency. Students must have at least two years of recent, active clinical practice or have received their RN in the past year. LMU offers all nursing courses online, but local students may be able to take some in-person classes at either the Harrogate or Knoxville campuses. Based in Bellevue, Nebraska, BU offers one of the most affordable online RN to BSN programs in the Midwest. The program examines the social, cultural, economic, and political issues that affect nursing, giving students skills in leadership, management, decision making, and general health promotion. Graduates are prepared to integrate research and theories into professional nursing practice, operating according to the highest moral, ethical, and legal standards. The core curriculum requires 40 credits, with courses covering topics such as healthcare regulation, population-based health promotion, and strategic nursing leadership. Students end the program with a two-course, hands-on practicum, which has them identify a relevant nursing or healthcare issue and work with a preceptor to devise and implement a solution. All students are also required to take the college’s Kirkpatrick Signature Series, a nine-credit course sequence that emphasizes the western intellectual tradition and the value of active citizenship. With more than 23,000 students, Clemson ranks as the second largest college in South Carolina, though it still maintains a student-to-faculty ratio of 16:1. The school’s nursing degree ranks among the top RN to BSN programs online. The program is offered through a cohort format, providing students with a more traditional learning experience. While the degree is offered primarily online, students participate in monthly interactive activities that allow them to build closer bonds with peers and faculty members. Courses include psychosocial nursing, mental health nursing, and healthcare genetics. Much of the degree is dedicated to clinical experiences, which allow students to build professional skills through simulation activities and fieldwork in healthcare facilities, such as clinics and hospitals. Clemson also offers two certificate options for nursing students: leadership and global health. Each certificate requires three additional courses and can help students distinguish themselves to employers. CU Online, the distance education platform of CU Denver, was founded in 1996 and ranks as one of the oldest and most prestigious in the country. Unlike many online RN to BSN programs, CU Denver accepts registered nurses from all around the country, allowing students from most U.S. states to earn their degree from a distance. The College of Nursing offers several scholarships for nursing students, providing students the opportunity to reduce the cost of their education. Emphasizing theory and evidence-based practice, the program prepares graduates to offer expert care to communities, families, and individual patients. The curriculum includes 30 credits of nursing major courses, highlighting topics such as the role and history of the profession, nursing law, transitions in nursing practice, and professional ethics. Students can also take up to eight credits of clinical nursing immersion courses, helping them synthesize course learning to develop best professional practices under supervision in a healthcare environment. Based in Boone, North Carolina, ASU offers a range of distance education programs, including one of the most affordable RN to BSN online programs in the region. The degree includes 30 credits of required nursing courses, covering major topics such as nursing care of communities, concepts of professional nursing, nursing care of older adults, and health assessment. With full-time study, students can complete the program in three semesters (about one year). After completing three semesters, students are awarded an additional 30 credits for clinical competencies through previous learning. ASU does not require students to perform a traditional field experience practicum at a healthcare facility. Instead, students complete a series of class projects and research projects related to professional healthcare practice. Applicants must possess an unencumbered RN license from North Carolina or a nurse licensure compact agreement state. University of Delaware, established in 1743 in Newark, is the oldest and largest college in the state. UD’s School of Nursing has provided distance education since 1993. The RN to BSN online curriculum requires 31 credits of nursing courses, including pathophysiology, topics in healthcare delivery, wellness and health assessment, and research concepts in healthcare. Courses include asynchronous and synchronous components, such as video lectures, real-time class meetings, and discussion groups. Students perform 84 hours of clinical practice at a local healthcare location, allowing them to gain advanced nursing experience in a supervised setting. Applicants can receive a free, unofficial transcript evaluation from UD’s academic advisors, who can help students determine their eligibility for the degree and develop a personal curriculum plan. 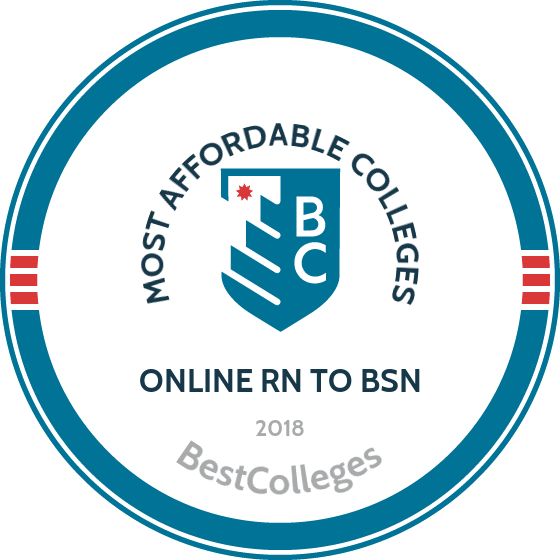 UMass-Boston, the third-largest member of the University of Massachusetts System, offers one of the most affordable online RN to BSN programs in New England. The school’s nursing degree is delivered in a cohort format that allows students to complete the entire course sequence together, providing a sense of student community. Available in either a full-time or part-time format, the program takes between three and five semesters to complete, depending on course load. Students take 30 credits of core nursing classes, including health assessment and promotion, legal and ethical health policy, and community health nursing. The curriculum also includes an 84-hour clinical practicum, divided between 54 hours at a healthcare agency and 30 hours of independent community work. While all courses are available entirely online, students must attend a residential campus orientation in Boston at the beginning of the program.